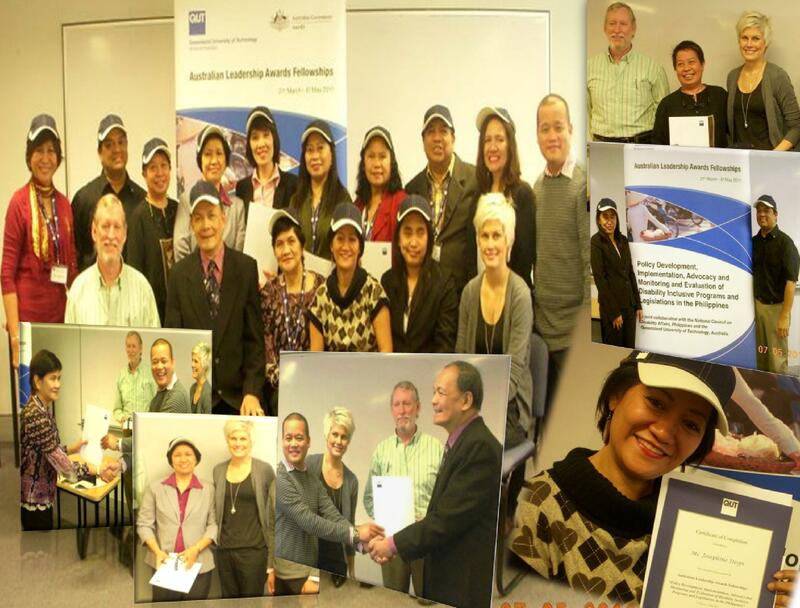 Browse > Home / Photo Releases / Filipino ‘Fellows’ of QUT-ALAF complete Training in Australia. Filipino ‘Fellows’ of QUT-ALAF complete Training in Australia. Filipino ‘Fellows’ (scholars) of AusAID’s Australian Leadership Awards Fellowship had just completed their training program on Policy Development, Implementation, Advocacy, Monitoring and Evaluation of Disability-Inclusive Programs and Legislations in the Philippines” in Brisbane, Australia last May 6, 2011. This is a collaborative learning partnership between Queensland University of Technology (QUT) and the Philippines’ National Council on Disability Affairs (NCDA). A 13-man delegation composed of 6 NCDA Employees, 4 representatives from its member-agencies and 3 from PWD organizations in the Philippines were sent to Australia to undergo a 7-week training program from March 21 to May 6, 2011. The program focused on 7 areas namely: (1)Introductory Leadership Program, (2)Training of Trainers, (3)Disability in Development, (4)Disabled People’s Organizations and Government-Led Bodies in Disability,(5) Advocacy and Networking,(6) Policy Development, Implementation, Monitoring and Evaluation, and (7)Re-entry Action Planning and Presentation of Output, where each was required to submit and present an Action Plan on specific measures for implementation on the first year after the course. The Filipino ‘Fellows’ are currently preparing their action plans in preparation for a post-fellowship monitoring to be conducted by QUT in Manila, to assess its progress and impact.